Every once in a while I get really lucky. One of those rare times was when we became friends. You have enriched my life, balanced my outbursts, been patient with my ups and downs, and generally have become someone that I cherish although we have never met in person. 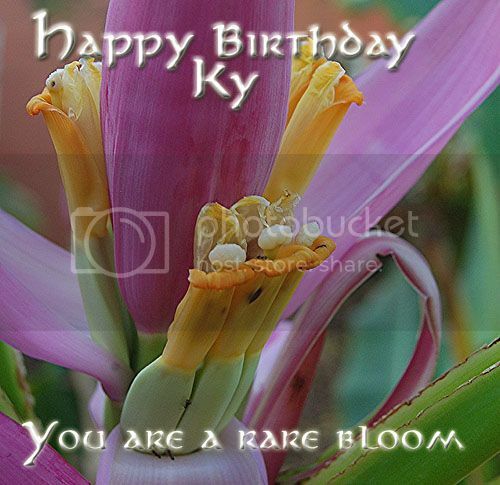 Because you are a rare flower, I had to search to find a rare flower for your card. Have a wonderful birthday filled with family and joy. You are the very first person to wish me happy birthday! I have been so blessed by our friendship. You have been so much a part of my writing and day to day journey -including the stint around the globe. Thank you for your creativity, your steadfastness, your warmth and your wise words! Flowers are such an important part of my life. I especially love unusual ones. I'm forever seeking out orchid shows to visit. For my birthday, we went to a show a couple of weeks ago, and I brought home an orchid with blossoms of bright green and purple. I have no skill with flowers, really, but I do love them. You are more than welcome. As I recall, this was a particular variety of dwarf banana flower. I saw it and immediately thought it would be perfect for a unique and precious friend.